I’m slowly working my way through the ‘Lækkermad 80/20’ book. 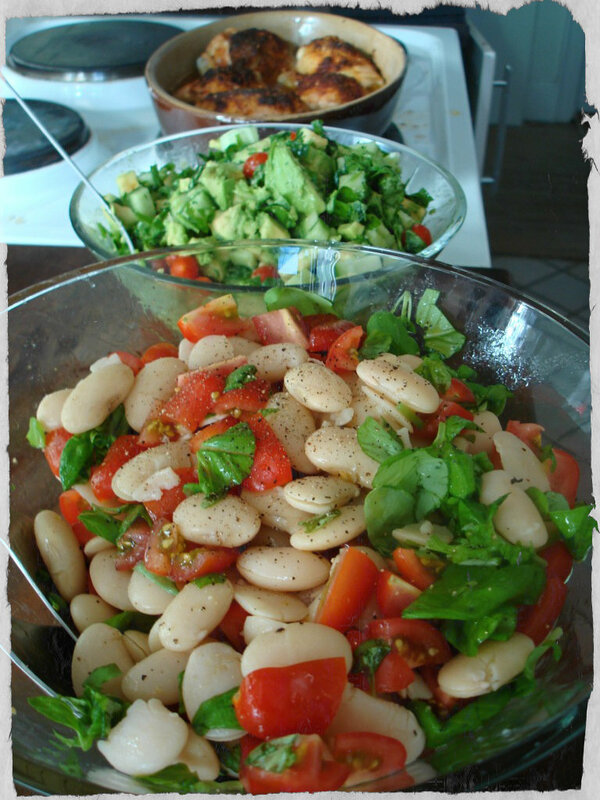 The other day we had some delicious roasted chicken with avocadosalsa and butter beans with tomato and basil. Very tasty, healthy and filling. Chicken pieces were about 50 minutes in the oven at 200 degrees. I had the spice them with salt, pepper, round spice and sweet paprika. Simple, but tasted great. 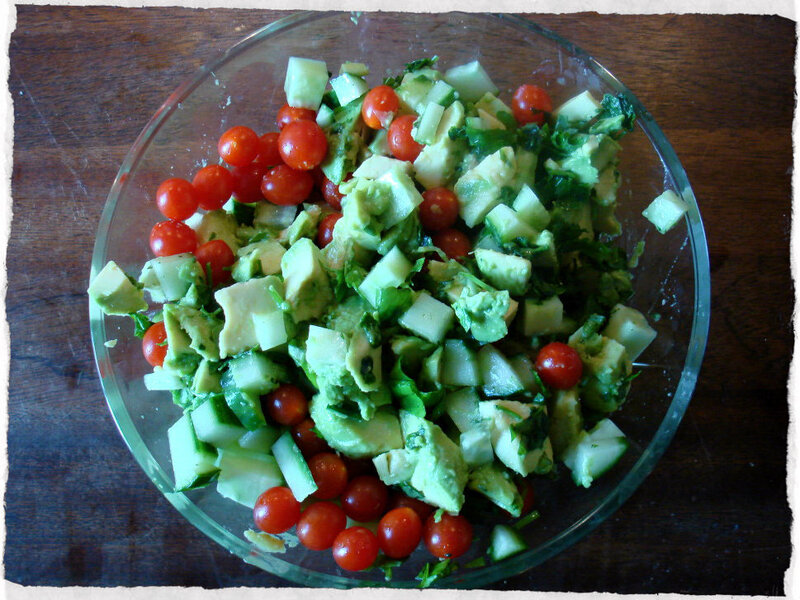 Cut the avocado and cucumber into small cubes. Chop the basil coarsely and mix everything well with tomatoes, lemon juice, sea salt and Tabasco. I used the fine mini tomatoes that I found the other day, they had just the right size and fit perfectly for this dish. I’ve never made a dish with butter beans before, but had them when I’ve been out to restaurants and cafes and thinks they are great. So when I saw this recipe I thought that now I had to try them out. I chose to buy a bag of dried beans instead of canned, so they were made ‘from scratch’. I did as directed on the bag, but nevertheless it took somewhat longer to cook them than directed on the bag. But after some time, they were cooked as they should be. Soak butter beans overnight. Make sure that they have plenty of water, so they do not dry out. Boil butter beans for approx. 1 hour. Chop the tomatoes and basil coarsely. 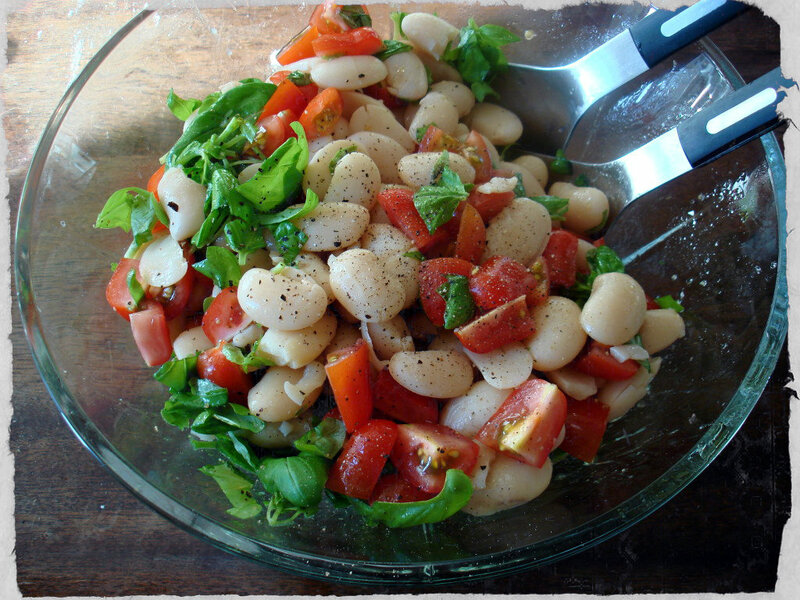 Mix olive oil, balsamic vinegar, lemon juice, salt and pepper into a tasty dressing and when the butterbeans are cooked, mix everything together in a bowl, and bon appétit. You can easily make this one hour before serving, it just adds more taste.